Why isn’t Britain First listed as a terrorist organisation? Although definitions of terrorism vary and often conflict, you’d be hard-pressed to find any that didn’t contain the notion of political violence combined with the threat of further political violence. Just before the Brexit referendum, a member of the British parliament, Jo Cox MP, was shot and stabbed to death by a political activist. We know he was a political activist because he had been photographed campaigning with the group Britain First, and it was the name of that organisation that he shouted as he murdered her. In court he shouted slogans calling her a traitor. Of course, there are no documents proving that Thomas Mair was a formal member of Britain First. In much the same way, there doesn’t seem to be such as thing as an Isis membership card. Both organisations seem to recruit principally via the Internet, where affiliations are notoriously fickle and rarely formalised. Mair’s proximity to the leadership of Britain First is much more remarkable than that of any number of European-grown Islamic terrorists is to the leading figures in Isis. No media outlet automatically absolves Abu-Bakr Al Baghdadi when one of his distant disciples ploughs a truck into pedestrians in Catalonia or shoots up a Parisean theatre. 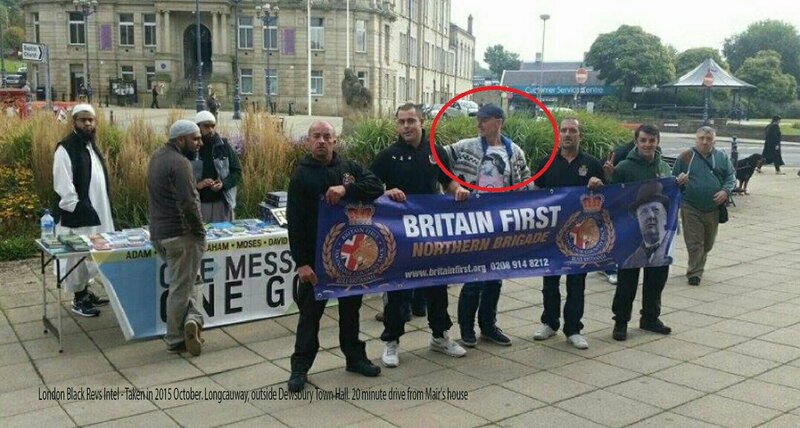 Much like both Isis and the EDL, Britain First is an online operation spilling onto the streets. Those who create its violently hateful propaganda are responsible when someone responds to their exhortations to murder ‘traitors’. Yet somehow, in the furore about Trump’s retweeting of three fake videos posted by one of the group’s leaders, the terrorist angle hasn’t been mentioned. This is odd, given the irony that in supposedly making a statement against terrorism, Trump was promoting it. He won’t face any action by Twitter, as he is their number one star player. Given that Twitter more or less did the decent thing by removing and decredentialing other far-right hate preachers a couple of weeks ago, a concerted campaign to get Britain First removed from the platform might succeed, and would cause huge embarrassment to Trump – or, given that he seems immune to such emotions, his cause. It’s also important to expose Nigel Farage’s links with BF. Although he has now denounced them as neofascists, Golding et al were very open in the past about their connections, even boasting in this video of attacking anti-UKIP protestors on his behalf. Anyone who was unfamiliar with Britain First but who still finds Farage’s shtick amusing also needs to be reminded that in the wake of the referendum he boasted that it had been won ‘without a shot being fired’. We don’t need to delve into his apparent family history in the National Front to see that his disassociation from the explicitly nazi movement is disingenuous at best. If Trump hadn’t come across Britain First before, it’s no thanks to Nigel Farage, who surely has Golding and Fransen among his email contacts, along with Robert Mercer and Julian Assange. In any game of Six Degrees of Separation starting from any figure in the international fascist movement, Farage’s name won’t take too long to crop up. His comment about the referendum being won without a shot being fired was an implicit statement of allegiance to a terrorist organisation which murdered an elected MP in order to stop her campaigning to help people fleeing war, in many cases fleeing from ideological fanatics who, as it happens, also use violence as a means to achieve political ends.